Cutting costs and environmental impact, while reducing intervention, this business printer seamlessly integrates into medium to large enterprises. A small to medium workgroup A3+ printer, perfect for business environments that have traditionally used lasers and want to increase productivity and reduce downtime and waste. 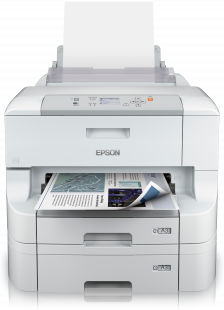 Epson's clean technology helps create a more environmentally friendly workplace, and PDL printer emulations and Gigabit Ethernet are ideal for enterprise integration. Take advantage of a low Total Cost of Ownership (TCO) and print up to 7,000 colour and 10,000 mono pages1 using, easy-to-change, high-capacity DURABrite Pro ink cartridges. The WF-8090DW uses up to 80 percent less power than competitive colour lasers2 thanks to its no heat technology. No ozone gas is emitted, and an improved quiet print mode and no fan noise during or after printing make it ideal for the workplace. And there are fewer parts to replace than a laser. 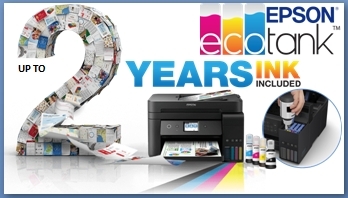 Print at up to 34 pages per minute (ppm) in both colour and mono, with ISO print speeds of 24 ppm for both3. The WF-8090DW delivers automatic double-sided A4 and A3 printing for eco-friendly and business-quality results. Scalable optional paper trays take its maximum capacity to 1,831 sheets, and the rear manual paper tray lets you print A3+ and onto a range of media. PrecisionCore technology powers the output quality and reliability that Epson is known for, at the speeds required for office, commercial and industrial printing. Wi-Fi and Wi-Fi Direct™ allow for easy integration and printing from smartphones and tablets. Users can also securely print using a PIN code to release jobs at the printer, or by using Email Print for Enterprise4 to securely send documents directly to the printer.